Setting up your WHMCS with domain registration is simple and another great way to increase revenue. For this example, we will be using an eNom account, but these steps apply to all domain registrars. Next you will want to locate the registrar you wish to use from the list. A full list of the natively supported WHMCS Domain Registrars can be located here. Note: Some Registrars require additional steps to be taken outside of WHMCS prior to configuring. These steps are outlined within the WHMCS Documentation found in the Registrar list above. Choose the Activate button for the registrar you wish to use. Upon clicking Activate, the page will reload and you will be able to input the data necessary to hook into the registrar's system. After filling the appropriate boxes out, click on Save Changes. That's it! 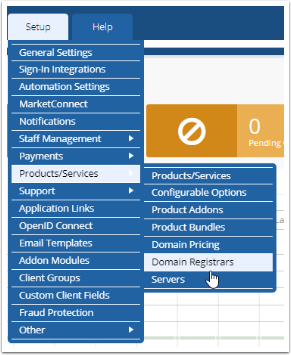 Your registrar is now configured to work with WHMCS and you can now set your Domain Pricing and begin to sell domains to your customers!